It has been said that very little that is meaningful and lasting comes without a struggle, and that has cer­tainly been the experience of the par­ish of Holy Trinity Church. 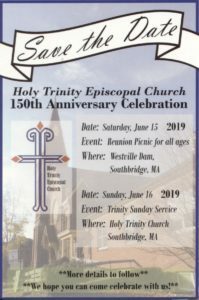 The first Episcopal mission in Southbridge was started in 1871, chiefly by the Grant brothers of the Columbian Mill and workers from the Print Works at Sandersdale. When these businesses fell on hard times, many families moved in search of employment, and the mission was closed. A second Episcopal mission closed in 1875 after the block of buildings in which it met was de­stroyed by fire. A leading member of the congregation, Mary Blair, died from exposure and overexertion. A third attempt to establish an Episcopal mission in 1879 was scarcely more successful, and by 1892 services in Southbridge had been discontinued. In 1909 a site was purchased at a cost of $2,000, and a building fund was started. Progress toward building was slow but steady. In the meantime a non­sectarian chapel called the “Union Church,” originally built by the Hamilton Woolen Company in the Globe Village section, began to decline in numbers and funds. The company offered to sell the church, parsonage, and land to the Episcopal mission for the sum of $20,000. At a special parish meeting on March 31,1921, by a vote of ninety-eight in favor and eight against, the trustees were authorized to sell the original site and purchase the “Mill Workers’ Church.” Bishop Davies preached the first service in the newly acquired church on May I, 1921. The congregation then embarked on interior renovations to make the new building more suited to liturgical worship. In 1930 the new church suffered severe damage from a fire caused by a defective furnace pipe. The parish rebuilt, and that church building was con­secrated in 1931 by Bishop Davies. A more serious fire caused by defective wiring damaged the facility in 1940. After each fire, local congregations and the diocese rallied to the aid of Holy Trinity. The building was again repaired and improved. 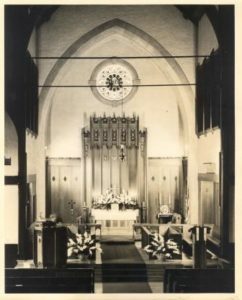 A children’s chapel was added, and Bishop Lawrence rededi­cated the facility in 1941. During the heyday of church attendance in the mid-1950s the parish was in need of more space. In 1958 the cornerstone for the parish hall was laid. The old rectory alongside the church was torn down to make room for the new addition and the current rectory on South Street was purchased. In 1987 Holy Trinity launched a capital campaign to address needed re­pairs. The goal seemed beyond reach, but with a gift by a parishioner and a diocesan loan, many of the repairs were accomplished. As the building contin­ues to age the need for further repairs has confronted the current congrega­tion. When the diocese embarks on the campaign to further the mission and ministry to which God has called it, Holy Trinity will follow suit, moving from maintenance to mission.Through programs such as Helping Hands, Head Start, and soup kitchen meals for the needy, the parish has provided assistance to the local community in the name of Christ. More recent missions and ministries involve support for the New Hope Shelter for abused women and the Christian Medical Ser­vices health clinic for those without insurance. The parish has been a leader in bringing the Interfaith Hospitality Network for Homeless Families into the tri-community area. Over the years numerous dedicated men and women have contributed much to the life and witness of the church in the area through tireless volunteer efforts. Without their unfailing loyalty, it is doubtful that the mission would have survived. Many, particularly the women of the parish, have distinguished themselves in the work of the diocese. To this day the parish has one of the more active Episcopal Church Women’s groups. In 2001 the vestry discerned the following core purpose: “Provide to those in need in the community, promote a stabilizing influence for instilling Chris­tian family values, act as a support group and social outlet, and provide a wor­shiping environment and spiritual fulfillment for all members:’ With God’s help, Holy Trinity will live this purpose.